One of the remarkable things about tending a backyard compost heap is watching how it keeps to its own internal time clock and rhythms through each passing season, regardless of the current weather conditions. It’s Groundhog Day. Some years here in coastal southern Connecticut there is more snow, or less, or spells of freezing cold or a stretch of mild, almost balmy warmth in the midst of winter that make it seem as though spring is just a few short weeks away. That’s the case this year, and as a pale, weak sun casts its shadow upon it, my pile is busy sloughing off its cloak of snow. It’s Groundhog Day, a day to ponder my pile through the prism of the present and past blending together along a continuum of deeper time. The scenario that follows has played out before — last year, in fact — and will play out again. Another winter storm has dumped 10 new inches of heavy wet snow on top of the foot or so already on the ground from the past three snowfalls, without a thaw between. From my kitchen window I see my pile is freshly cloaked by a smooth mantle of glistening white. My pile is serene in its winter repose. It blends seamlessly with the rest of the backyard landscape, more now snow pile than compost pile. A winter view of my pile under a fresh mantle of snow from a few years ago. Groundhog Day. I don’t need some silly little varmint to tell me to expect six more weeks of winter. With this much snow on the ground, it will be weeks before we see even a patch of grass. It’s a pain keeping the driveway and porches clear, and there’s no relief in sight; more snow is forecast. Snow, shovel, repeat. Groundhog Day. A special day, for it inspired a movie that in its own way explains my pile and my fascination with it in a way that I cannot. Groundhog Day, writes Michael Foust in Philosophy Now: “Viewed on the most trivial level it’s just another Hollywood rom-com, but on closer inspection it furnishes a dazzling treatment of Nietzsche’s concept of eternal recurrence, even illuminating Deleuze and Irigaray’s conflicting interpretations of this key Nietzschean idea. Eternal recurrence is Nietzsche’s idea that we have lived the exact life we are living now an infinite number of times in the past, and will do so an infinite number of times in the future. Barbara O’Brien, writing on AboutReligion.com, gives the Zen point of view: “OK, so maybe it wasn’t intended to be a “Buddhist” film, but many of us have adopted it. For the one or two of you who haven’t seen it — the film follows the life of Phil Connors (played by Bill Murray), as he re-lives the same day over and over and over. Eventually he begins to pay attention to each moment and each person he encounters, and to care. And when he finally gets it right, he wakes up to a new day. In a talk on Groundhog Day, Zen teacher Dairyu Michael Wenger noted that the film also is about karma. Each time he re-lives Groundhog Day, he makes different choices, and each choice leads to a new reality. The days are extraordinarily different from each other, even though the only thing that changes is Phil himself. Like Phil Connors constructively idling away in Punxsutawney, I put a lot of energy into my pile, day after day. My pile is a creative act that offers the prospect of improvement over time yet invariably turns out the same, year after year. Groundhog Day. With my pile buried under its new load of snow, I have time to dig through the journal I’ve kept about it for some years. The journal provides the raw material for this blog. Most of the many words I put down are as inchoate as the leaves and such that I gather up for my pile. But what’s striking about all the fodder is how familiar the past entries chronicling the yearly passage of “eternal recurrence” are to the current season. Thinking of my pile while I lay in bed, I hatch a plan to return to the coffee shop to get more coffee grounds. My pile is buried under a couple feet of snow, but here’s the deal: I’ll sprinkle the grounds across the surface, like chocolate shavings on vanilla ice cream. In reading about global warming I’ve heard of the albedo effect – dark colors absorb more heat from the sun than white, which reflects it. The loss of snow cover in the Arctic has exposed more rock and water, triggering a feedback loop of ever-intensifying warming. The dark coffee grounds will serve as tiny heat sinks across my snow-covered pile, warming themselves down through the snow until they finally meet leaves. How elegant! New entry: The scattered grains of coffee look just as I had dreamed; like chocolate sprinkles on whipped cream. Later on the sunny winter afternoon, I trudge along my ever-widening boot marks to beat a path back to my pile. The dark grounds have etched their way into the snow, staining it like a pile of old rotted snow on a New York City sidewalk. The New Year’s holiday is over, and I haven’t touched my pile over the weekend, unless you count peeing on it during breaks from watching the bowl games. The snow that still carpets the lawn is a week old and now has changed from fluffy flakes to ice crystals like the kind you crunch from a snow cone. I step along the left-side log wall and see that my pile has fended off the onslaught of snow I shoveled over it, at least partly. I see a blow hole, perfectly round, and first think it’s from a gopher or rodent. A close-up of a vent hole in my pile created by escaping heat from within. I peer in and can see matted leaves about six inches down; the entry way widens to a separation of snow and leaves. I am relieved to see that my pile has enough stored energy to fight off this avalanche of snow, or perhaps it was newly energized because of it. My pile is venting along the paths of least resistance, out to the side. It was silly of me to think that it would behave like some Vesuvian volcano and spout puffs of smoke out the top like some sort of papal announcement. I step back and regard my pile. A year has turned, at least by the calendar, and with the turning over of that new leaf I see that the pile has sagged under the snow, with the summit now lower than the upper reaches of the log steps. I walk around the back of the pile, and see that the back of the pile has sagged far enough down to create a depression between the center and the wire fence. In adding fresh material to the pile, I usually leave a rim of undisturbed leaves against the back fence, for insulation mostly, but I also don’t want any banana peels or egg shells hanging out for critters or me to see. I keep a tidy pile, and it keeps its secrets well. I know it only superficially, I admit, its beauty to me is skin deep, and I know there are mysteries beneath the surface that I am only beginning to fathom. I don’t know exactly how far under the surface the snowmelt has soaked; only a fuller excavation will tell me that. Though my kitchen “Hooch” bucket is nearly filled to the brim with the remains of the holiday, I hesitate to disturb the pile. I know from past snow dumps that if I turn the pile over and bury snow inside it, the colder reaches within will insulate the snow. Or, perhaps the snow itself will freeze up my pile from within. One year while depositing some kitchen scraps, I tucked in clumps of snow from a late March storm. 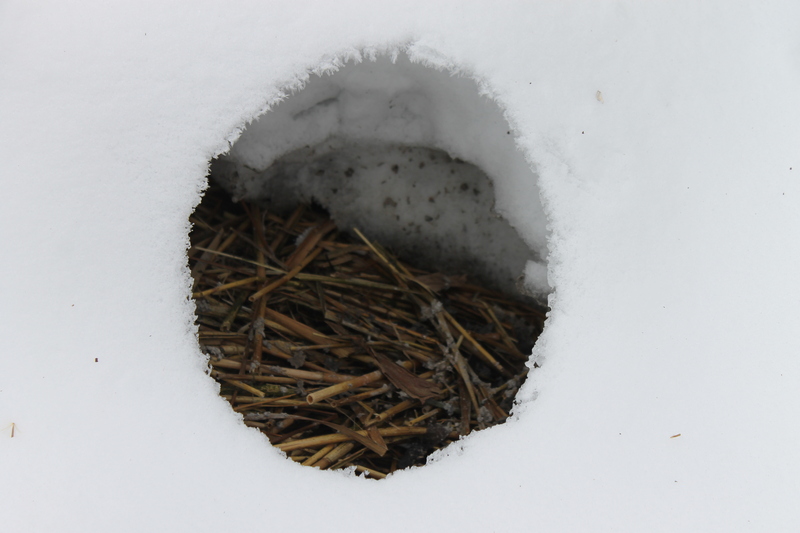 When I got back to tumbling the pile over on a warm day in early May, I uncovered those same lumps of snow. Groundhog Day. I trudge out to inspect my pile close-up, first ducking inside the neighboring saltbox tool shed to hang a plastic bag full of kitchen scraps from a spare hook on a ceiling rafter. The kitchen bucket was crammed full of two weeks of scraps and coffee filters and beginning to fail the sniff test. Its vinegary contents will soon freeze to wait out the snow in suspended animation. Sure enough, my pile is pock-marked with fresh vent holes rimmed with hoar frost and that lead to caverns of air above damp matted straw and leaves. The sides against the log walls and the front, which faces north, are still thick with snow. In time, the warming sun will melt and evaporate my pile’s winter blanket, but that day is a long way off. My pile is an endless loop of new life reborn out of decomposition and decay. It is a stage unto its own. And I am happy to play a supporting role. Groundhog Day. 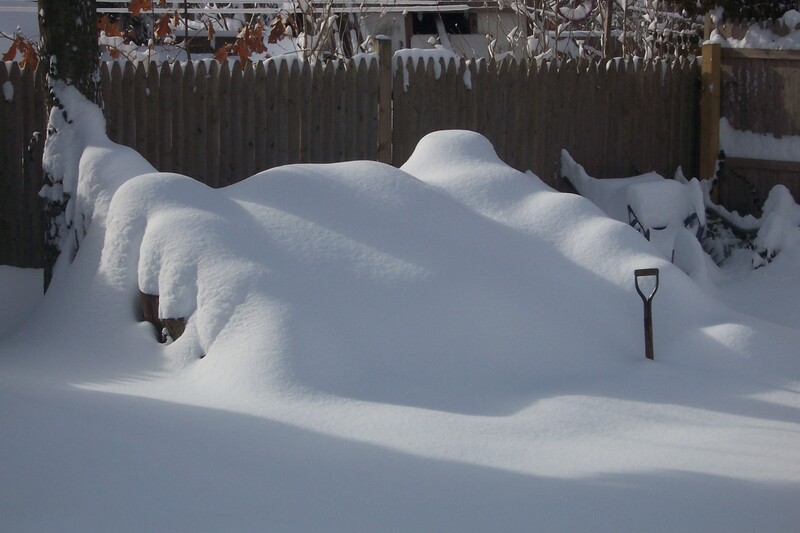 A view of my pile from a snowstorm a few years ago. 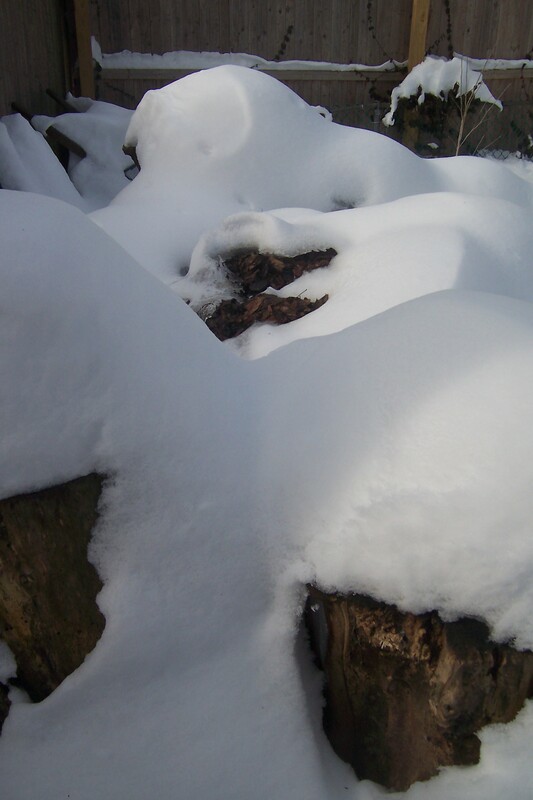 The snow remains high on the log walls, but has nearly disappeared from the heap itself.